We have come a long way since the time when a house was simply a brick and mortar structure which offered us shelter, protection from the elements, and opportunity to work, relax and live with loved ones. 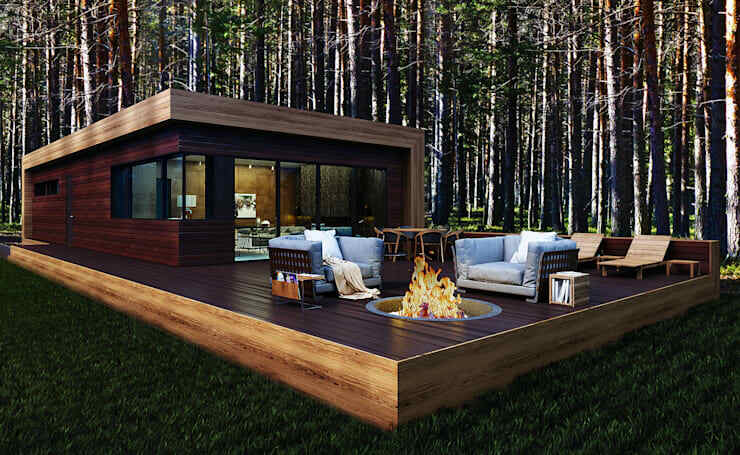 Today, a house reflects your social status, your dreams and aspirations, your individuality, and your strongest desires. So if money and resources is no object, then nothing can stop you from building a residence which stuns and provokes the envy of onlookers. Set up on a solid and expansive wooden platform, this linear and chic wooden house is a joy to behold. The dense forested backdrop only enhances the warm, cosy and exclusive elegance of this abode which reflects the owner’s love for the outdoors intensely. The major part of the platform is used as a patio with an in-built circular fireplace, plush armchairs, lazy recliners and a seating arrangement for open air meals. 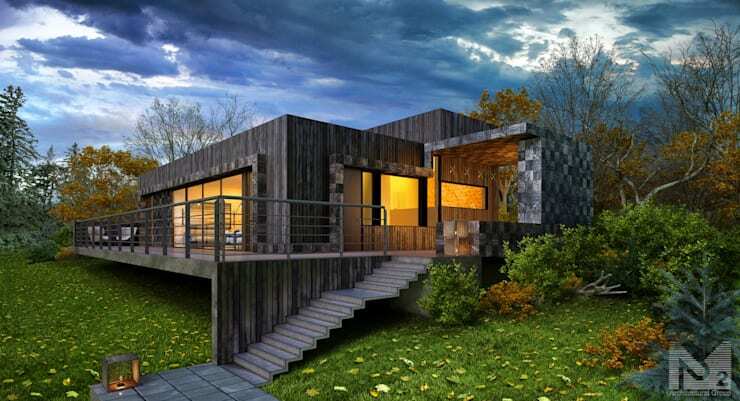 Designed by Aleksandr Zhydov Architect, architects from Kharkiv, this house promises sheer pleasure. Finished in sophisticated grey tiles and wood, this house is an ultramodern wonder in the middle of a lush green landscape. Slim steps lead to the raised terrace and porch, while the soft interior lights shine through the massive glass windows. Imagine how happy the inhabitants are to wake up to the stunning view of nature surrounding the property every day. 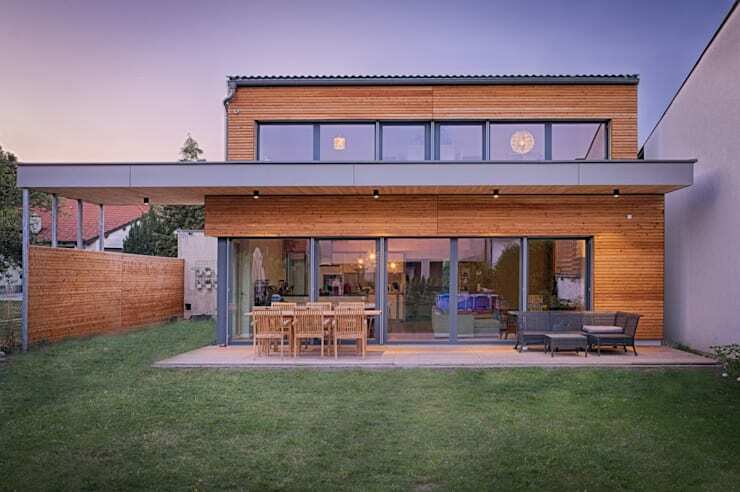 Situated in an upwardly mobile neighbourhood, this simple yet stylish box-like house is an urban delight with a warm touch of wood for the entrance. The monochromatic structure looks over a neat and sparkling clean patio, complete with embedded lights on the floor. TIP: Click on the photograph to view the project. Nestled amidst dense and verdant foliage, this house is a fine example of contemporary architecture with a hint of imagination. The generous use of glass for the facade lets the inhabitants enjoy the lovely outdoors even when they are relaxing inside. Stones clad the terrace which is fitted with a couple of cosy armchairs and flaunts enticing sconce lighting. The pointy eccentric roof of the house floored us at the first sight, while the shimmering blue pool soothed our senses. 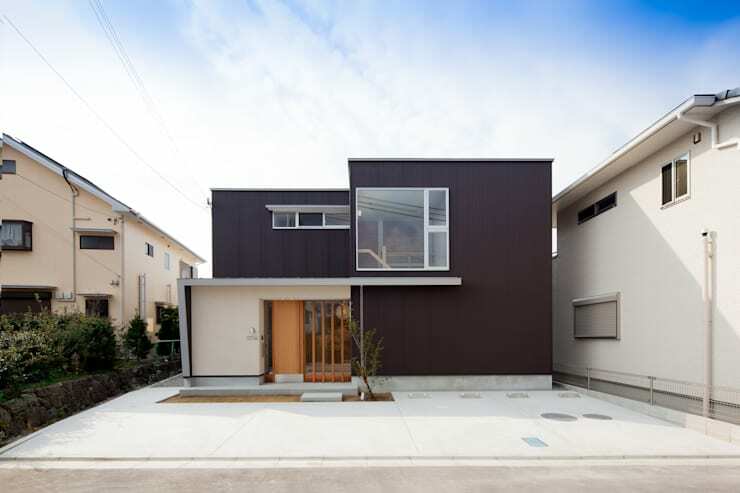 It is interesting how stone, glass, wood and concrete – all line the facade to produce a dramatic effect. 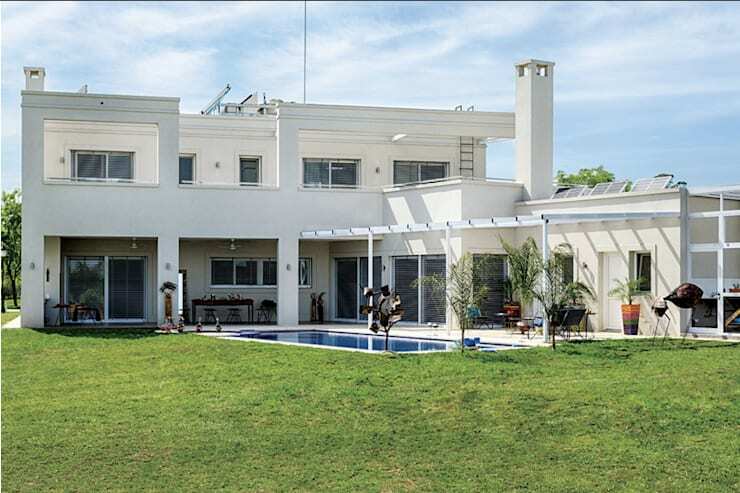 Potted plants, manicured lawns and towering trees dot the landscape, while the house looms over us with its unique appeal. 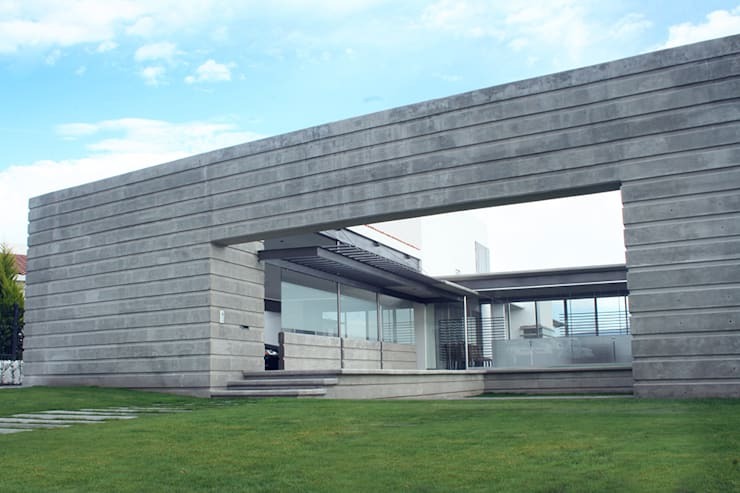 Elegant but austere grey concrete is what makes this expansive and stylishly austere residence exclusive. Surrounded by lush green grass which makes its way inside the property to line its courtyard, this villa is a show stopper for sure. The ample use of glass cleverly integrates the indoors with the outdoors, and let the owners enjoy both sunshine and rain with equal élan. 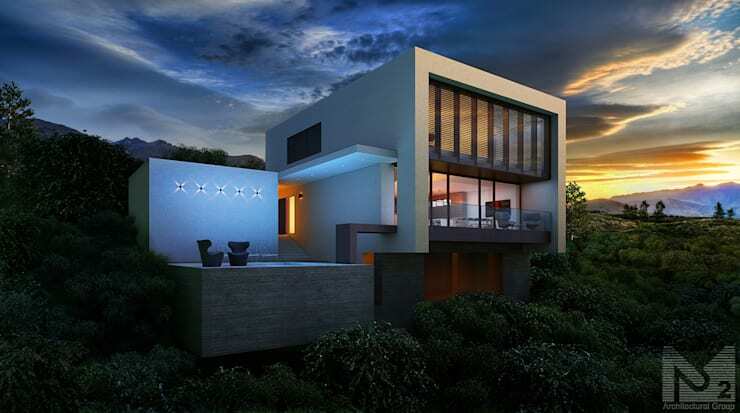 This ultramodern home is a massive splendour lined with glass for a delicate and awe-inspiring look. Every single room lets you soak in the beauty of the green lawns and enticing pool under the clear blue skies. The pool is flanked by a shaded deck with recliners that allow you to laze around aimlessly or host a delightful pool party. The effect is wonderful! Wooden slats in a rich and warm hue have been paired with a lavish amount of glazing to create a homely but fashionable result. 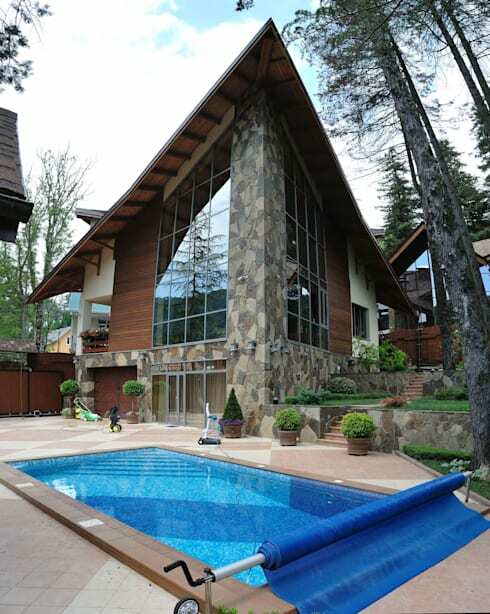 The glass allows unrestricted view of the outdoors, and lets the interiors merge with the exteriors seamlessly. The deck is equipped with a wooden dining table set for happy family meals and rattan sofas for tranquil relaxation. Completely rendered in pure white, this sprawling mansion oozes summery charm against a green backdrop. The rooms on both storeys lead to outdoor spaces where you can enjoy fresh air and breathtaking views of the surroundings. The idyllic setting looks all the more enchanting; thanks to the cool blue swimming pool that promises instant rejuvenation. Inspired by the gorgeous houses we just saw? Why not get started with your own home now, and design it with some of the brilliant ideas collated here. Consult an architect or builder for the best results. Here’s another story which might pique your interest - 6 extraordinary garages to store the car.